From Cusco you don't have many options to reach Machu Picchu. There is no direct road between Cusco and Machu Picchu and there is no plane or helicopter service either. But they do have an awesome train service between these two cities. Most of the Machu Picchu lovers use this option. Train service is comfortable and you will certainly enjoy the window view during every moment of the train ride. There is another alternative route exists between Cusco and Machu Picchu. You can reach Ollantaytambo from Cusco by bus or taxi. Ollantaytambo lies in between Cusco and Machu Picchu. Once you reach Ollantaytambo, it is easy to reach Machu Picchu from there as Ollantaytambo is connected to Machu Picchu by train. leave at every day morning from Cusco and comes back at evening the same day. 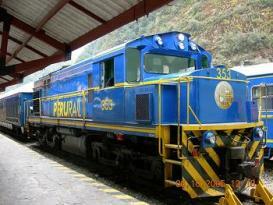 Peru rail is the only company who operates the trains in Peru. They provide three different types of trains to Machu Picchu. You can choose Expedition, Vistadome or Hiram Bingham express. Price of the trains depends on the service they provide. Check my page on the timetable and ticket fare of the trains. Actually there is no direct road from Cusco to Machu Picchu. But still there is an alternative way to reach Machu Picchu, which is a combination of train and bus. You can go to Ollantaytamboby local bus or by taxi, if you want you may stay there a night. There is a famous ruin in Ollantaytambo, you can enjoy your time there. Ollantaytambo is directly connected to Machu Picchu by train. Usually it takes around 5 hours to reach Machu Picchu from Cusco, if you choose this route. The distance between Cusco and Ollantaytambo is 65 km (40 miles), and you need to pay $35.00 for taxi ride. You can save more money if you travel by local bus as bus fare is around only 5$. So here you need to pay 52.00$ for train from Ollantaytambo to Machu Picchu. So for return journey it would be (52+5) x 2 or $ 114.00 by local bus and Expedition train, whereas it is $ 73.00 if you travel directly from Cusco (Poroy) through Expedition train. To get more detail on fare and timetable read my page on Machu Picchu trains. Train will take you up to only Aguas Calientes. You can walk from there to the ruins. But it takes more than a hour if you walk. Regular way is to take the bus from the center of the town. From 5.15 in the morning, up to 3.00 pm buses are available to reach Machu Picchu ruins. Though it is only a two kilometer distance, it takes around 20 minutes to reach the ruins. Buses pass through zigzag and winding way through the mountains. The journey is really enjoyable. Read my page on how to catch bus to Machu Picchu in Aguas Calientes. A helicopter service from Cusco to Aguas Calientes is now available (yes, trust me) for those who like to pay extra money to get maximum comfort. This service was provided by a 12 passenger helicopter by Heli- Cusco.